As a fan, there is not much you can do to magically help your favorite team win. Except when it comes to toasters. What if your toaster could do more? What if it picked you up from the airport, or volunteered to babysit the gang of preteen barbarians you call your children? How thoughtful! What if it helped your favorite basketball team finish the regular season on a rampage en route to an NBA championship? Now we’re toasting. Our story begins with Ronnie Reyes, a resident of Hayward, California. “The inspiration started when I received a Warriors-branded toaster from my cousin for a Christmas gift exchange in 2013,” Reyes said, according to sfgate.com. But Reyes, known to some as the toaster guy, and his family, already had a Warriors-branded toaster. We can only speculate that this first toaster is living a normal life, tastefully toasting toast. The second, however, was destined for greatness. 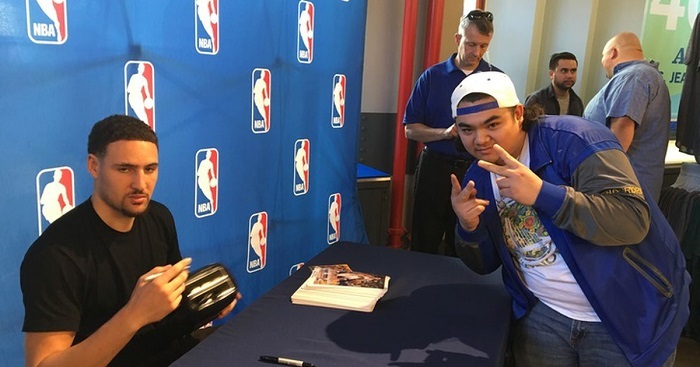 Reyes, also known as Rdollaz on Reddit, heard that David Lee was having an autograph signing, so naturally, he took the toaster. And it certainly left an impression, as Reyes then proceeded to get the toaster signed by as many players as he could, including Draymond Green and Warriors’ commentator Jim Barnett. Then came the fateful day in March 2017, when Klay Thompson was presented with the toaster to be signed. This moment was photographed and soon after went viral. Thompson can be seen in one photo holding the toaster like a baby with a full diaper, and in another photo signing the breakfast appliance with a smile as Rdollaz throws up two peace signs. I have heard stories of politicians signing babies and even the Pillsbury doughboy signing a fan’s stomach, but they didn’t lead to a re-election or a summer of free cinnamon rolls. What elevates this strange story from quirky to legendary is the Warriors’ post-season success that followed, and the iconic status that Rdollaz’ toaster achieved. After the Klay Thompson toaster autograph signing, the Warriors went 31-2 for the rest of the season, including a 4-game sweep of the San Antonio Spurs in the Western Conference Finals and a 4-1 beatdown of the defending champion Cleveland Cavaliers in the NBA Finals. And all along the way, the NBA Reddit community watched in disbelief and amazement, with many users commenting on how memes truly can become dreams. At one point, Reddit user thesnacks says “If they go 31-0 I am buying one of those toasters. Not a championship hat or shirt or anything like that. Just the toaster.” And Mychal Thompson, Klay’s father and former Los Angeles Laker, said all the Warriors’ season ticket holders should get toasters if the team won a championship. There is no shortage of love for the John Hancock-ed toasting machine. After the Warriors were crowned champions, Thompson invited Reyes’ now ‘the toaster guy’, to ride on one of the parade route buses, which he did, alongside Rickey Henderson, Barry Bonds, and other Bay Area legends. Today, the infamous toaster lives a quiet life in Ronnie Reyes cupboard. It has retired from making bread stiff and is living the life of a stud, with reports of it being seen with an Italian panini maker, and even a George Foreman grill. The Warriors march to become the 2017 NBA Champions helped to redeem the team from the epic finals collapse the year before. 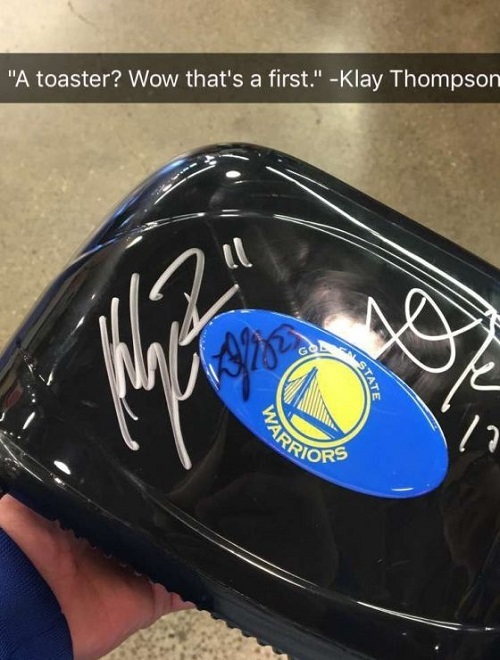 But it doesn’t happen without the Klay Thompson toaster. To be sure, Steph, Draymond, KD and the rest of the team worked hard for their success that year. 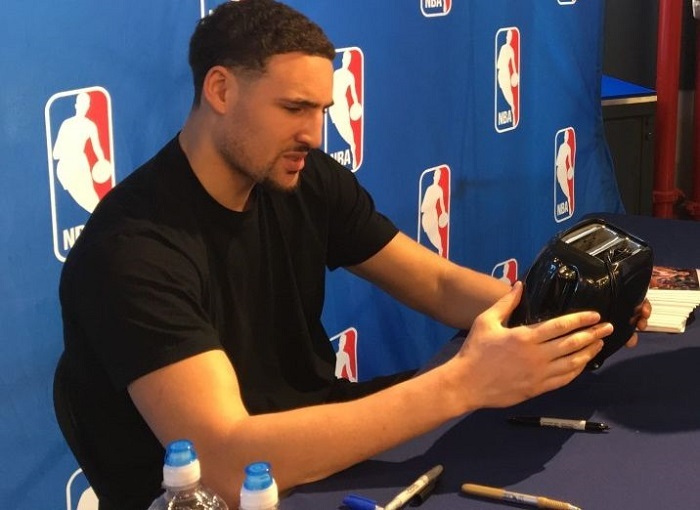 But we are left wondering what might have been if it wasn’t for Klay Thompson’s autograph signing. Of a toaster.